A thought provoking, illustrated, leggit and worthy epidemic. But not well written and not well argued. 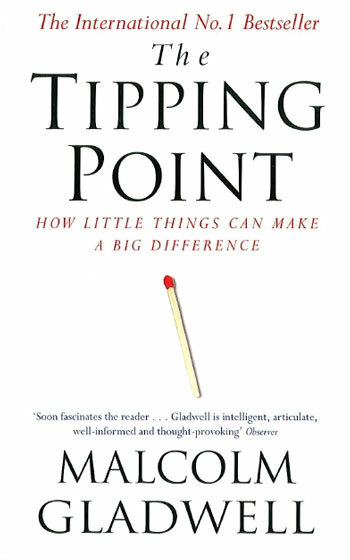 In this book, Malcolm Gladwell deals with a socio-psychological phenomenon – the tipping point – the point where the tides turn, where things change and an avalanche happens. He also breaks down social constructs and study them to figure their inner working. It starts with studying examples of epidemics like: popularity of Hush Puppies in the mid-1990s, break out of Syphilis in Baltimore and the magical fall of crime-rate in New York. What made them tip? There are three kind of people who play a part in a social epidemic: Connectors (people who know hell lot of people), Mavens (people who know hell lot of information), and Salesman (the charming persuader). At this point, the book seems to be a good collection of, now, geek-pop-culture concepts: Six degrees of separation, 80/20 principle, weak tie, non-verbal communication etc. An ideas need to sick with you to turn into an epidemic. The theory is beautifully illustrated by a well researched case studies of Sesame Street and then Sesame Street vs. Blue’s Clues. If nothing else, this itself is worth a read. Small factors make up the context for an epidemic to break out. New York’s miraculous drop in crime rate, according to Malcolm, wasn’t a result of some special divine force; but simple things as scrubbing off graffiti and penalising people who broke relatively harmless laws – like peeing in public and didn’t pay for their subway ticket. Malcolm also discusses the rule of 150 – maximum size of a social group which can have a meaningful relationship. This magical number, he presents, has been ever presented and arrived upon by numerous groups with trail and error like — Gore and Associates, Army companies etc. The two case studies make a remarkable ending for the book. The case of rise and fall of Airwalk made for a full cycle case study. Something these kind of books miss out on, usually. The case of Teenage smoking and recreational & experimental suicide attempts by young boys in Micronesia was remarkable. The book is well presented, illustrated with well researched examples (for the most parts) and keeps you thinking. It’s thought provoking. It often made me get up walk while reading in excitement, something I do when I am thinking very fast and focused. Passive were the writings of this writer. Distractive, that was. The book was one-sided arguments. The other possibility was rarely considered in most case studies and examples. Only the case study of teenage smoking phenomenon was well argued from both sides. There were many places where the logic broke down, or one thing didn’t really lead to another. There were oblivious flaws, and half-baked concepts & notions. The Tipping Point was written back in 1997; and since then we have seen better example of these theories. The book has aged and is being left behind. That could be a good thing. To see how well the theories fit (and they do) in today’s world of internet and connectedness. Over all the book worked well for me. It makes for a very thought-provoking read if not enlightening to some extent. Published on August 16, 2013. Updated on December 9, 2013.